Unfortunately, many homeowners have leaky, inefficient ducts, which force your HVAC system to work longer and harder to get your home to the right temperature. Not only does this waste money and energy, it will make your home uncomfortable. Dr. Energy Saver can help you solve these problems with our complete ductwork solutions. We will inspect your home to identify problem areas and recommend solutions such as duct sealing, duct repair, and duct insulation. Contact your local dealer today to get started with a free estimate! Duct leakage: Duct leakage causes conditioned air to escape before it reaches certain rooms, meaning your heating or cooling system will need to run longer to get rooms to the desired temperature. Under-insulated ducts: Missing or inadequate ductwork insulation works against the HVAC system during heating and cooling seasons, forcing the HVAC system to heat or cool the ductwork before proper temperature air can reach a room. HVAC costs escalate, and some rooms stay too hot or too cold even when the HVAC system is operating. Unbalanced air flow: Unbalanced air flow due to register location causes some rooms to get too much heat or cooling, while other parts of the house get too little. 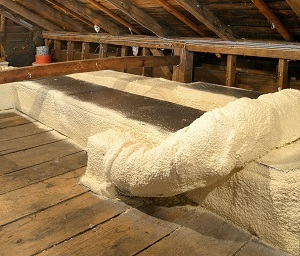 If your heating and cooling ducts are located in an unconditioned attic, such as shown here, you are losing hundreds of dollars annually due to heat loss from ducts in winter and heat gain in summer. 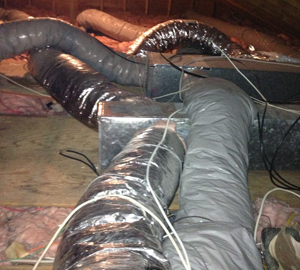 Supply and return registers are the only visible signs of the ductwork system when you walk around your house. But behind these grills is an extensive network of air passageways fabricated from different duct materials. If you have problems with an inefficient HVAC system, uncomfortable rooms, or high heating and cooling costs, Dr. Energy Saver is here to help. Our complete duct repair, sealing, and insulation services will keep your home's HVAC working efficiently and effectively. Contact your local dealer today to take the first step towards making your home more comfortable and saving money!